Charity marketing is no different from marketing of any other business when it comes to financing. But while for-profit companies have autonomy over their budgets, you don’t have such a privilege as a charity worker. If you blow a lot of money on promotion, what will the needy get? You raise funds to support them, not your organization. Imagine what happens if people who entrust their money to you will find out about unreasonable spendings. The word will get out and destroy your reputation. The good news is you can generate some buzz around your nonprofit online. And you don’t necessarily have to hire SEO professionals charging four-figure prices for their services. Having the right resources at hand, you can optimize your content with traffic-driving keywords yourself. It’s a perfect opportunity to keep your charity costs to a minimum. Learn how to do it step by step in this DIY guide. 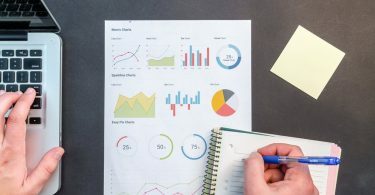 If you are just starting out, you are unlikely to outrank long-established charities using broad keywords like “New York charity.” Unless, of course, your organization is located in a small town that has little to no competition. In this case, a different keyword pattern will work for you. Put yourself in the donors’ place and think of how they may want to help the needy. A lot of their queries are based on the donation intent. Some people search for places to share what they have — not necessarily money, but also food, blood, clothes or, say, devices they don’t use anymore, etc. Others choose a specific group of people or institutions to support, e.g. schools, churches, refugees, victims of natural disasters, etc. To bring more visitors to your site, also consider running a blog there. Sometimes, donors don’t know how to do charity work the right way and browse the web for answers. You can write detailed posts around their queries to guide them on various charitable initiatives. 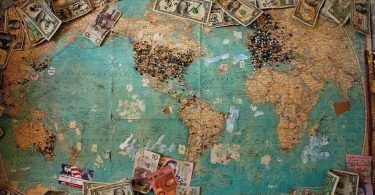 There are many places to learn about donors’ queries – social networks, forums, Quora, and even Google. With its Autocomplete feature, you can see different variations of the query while you are typing it. In the block of Related Searches, you can explore even more relevant suggestions for your query. Just like, there’s there’s G7 in politics G4 in keyword research. This is a group of four keyword metrics that have a direct impact on traffic generation. If you ignore them, your charity is doomed to lag behind the first page of search results, where no generous donor will find it. 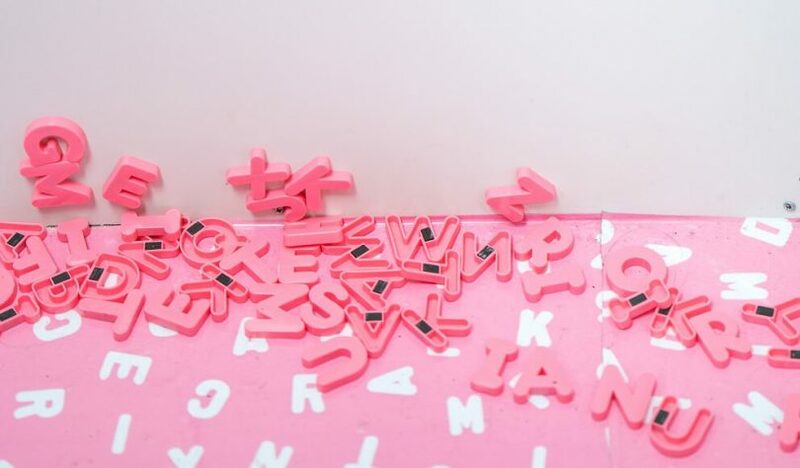 Check out the key metrics to take into account when picking keywords for your content. As mentioned above, long-established charities already take the first search positions for broad keywords. To push your way to the top 10, you must use more specific phrases known as long-tail keywords. They have low search volume (40-80 searches per month) and usually contain more than three words. You may think that 80 monthly visits can hardly bring you a lot of donations. And you’re right, but here’s the thing. Content optimized for one long-tail keyword can rank for hundreds. Having the same search intent in mind, different users often phrase their queries differently. And in the era of RankBrain, Google puts their search intent over exact-match wording. Here’s a quick example. For the query “charity for homeless kids,” Google returns organic results optimized for “youth” and “children” besides “kids.” Today, the engine understands synonyms and equates them when processing search queries. So, if you pick a long-tail keyword with 50 monthly searches, you will drive much more traffic than that. Among broad keywords with high search volume, there are also some low-hanging fruits. These are keywords that have a low ranking difficulty, making it quite easy to appear on the first page of SERP. For example, the keyword “PayPal donation” gets 3.2K monthly searches. But its ranking difficulty is quite low — 18 on the 100-point scale. So, you should try it in your content strategy. Not all promising keywords bring a lot of page visits, if any at all. With the launch of Knowledge Graphs, Google gives answers to specific queries at the very top of SERP. So, users don’t need to scroll through organic results. Let’s say you want to optimize your content for the “Red Cross founder.” Here’s how SERP looks for this keyword. Users see who the founder of the Red Cross is straight away. There’s no need to visit Top 10 pages below, that’s why 76% of searches get no clicks. Make sure you always check how SERP looks for your target keyword. Some charity topics enjoy popularity within a specific period only. For example, the interest for “Christmas volunteer” starts growing in October, reaches its peak a few days before the holiday, and then suddenly drops. For the rest of the year, it remains at a minimum. The bottom line is such a keyword will bring you a lot of traffic only in high season. When doing keyword research, go to Google Trends and check seasonality of each target phrase. Let me tell you a secret. All the reputable charities have already done the hard work for you. They know fruitful keywords of your niche and actively use them in their content. Luckily for you, there are special tools that reveal competitors’ secrets. They are known as SERP checkers in the SEO community. SERP checkers show what posts rank in the Top 10 for your target keyword, how much traffic they get, and keywords bringing that traffic. Using their easy-to-rank keywords, you will have a chance to drive some of their visitors to your site. No doubt, replicating someone’s success is worth your time. But if you have nothing unique to get people interested in your charity, it will probably flop sooner or later. Why on earth should people who donate to charities they know and trust switch to a new organization? It makes little sense. 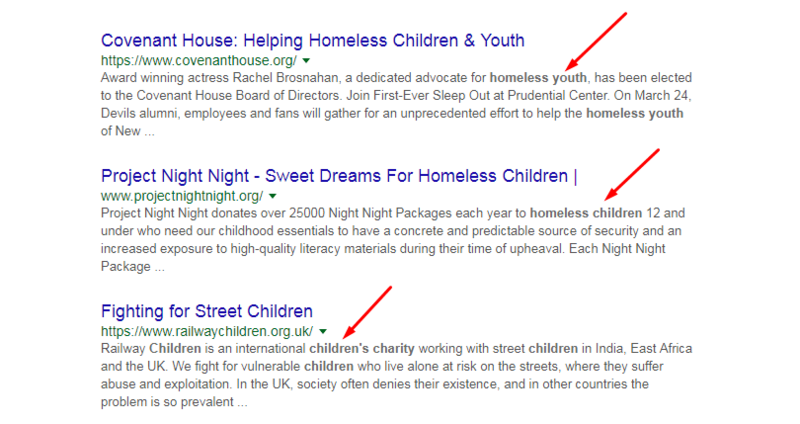 Click on any charity keyword, and you’ll enter Google search results. If you see there are only questions on forums and Quora, it probably means no one has given a detailed answer to your target query yet. It’s your chance to be a groundbreaker. 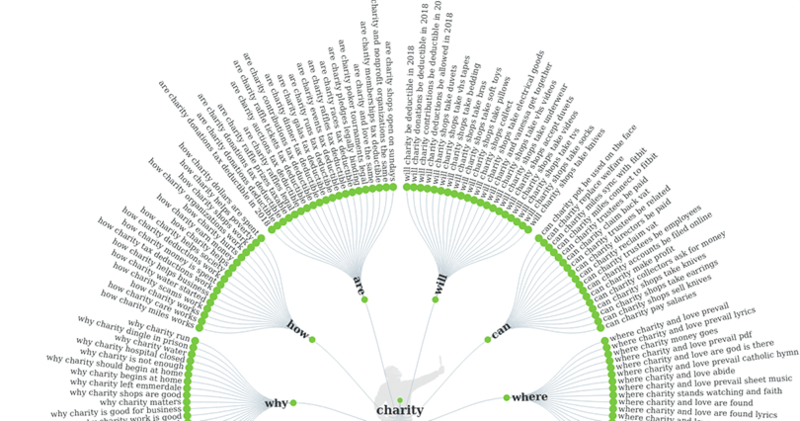 Sure thing your charity site can’t have all those keywords even if you distribute them among 100 pages. That would be too spammy and risky. Google penalizes for content overloaded with keywords. What you need to do is to weed out phrases that differ in grammar rather than meaning. With the launch of RankBrain, Google doesn’t interpret search queries word for word and letter for letter anymore. Instead, the engine analyzes what users are trying to find. In the process of analysis, its algorithm equates a lot of things. You’ve already seen an example with synonyms in Step 2, but there are more nuances to keep in mind. Here they are. For all these queries, Google returns pretty much the same results, both in a featured snippet and organic search. There may only be some differences in their SERP positions. As you can see, keyword research is not a difficult task. With this DIY guide, you can find traffic-driving keywords yourself instead of paying someone for the same job. You just need to understand your audience, keep a few metrics in mind, and be able to sort out gems from clutter. Besides keyword research, you’ll also need to invest some time in link building. Google’s algorithm considers keywords and backlinks the main ranking signals. P.S. : If you have succeeded in charity fundraising, feel free to share your experience in the comments. We are curious to hear your story! About the author: Nick Campbell is a content creator and marketer at Ahrefs with passion for technology, SEO, and copywriting. Work up every idea from chaos to clarity is his motto.